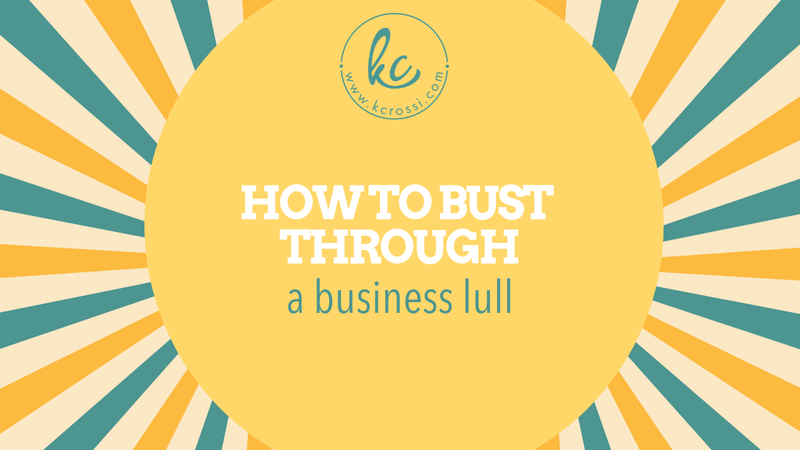 Despite putting in the work, there are times when it feels like our business is “stuck,” like something is holding up the flow. It’s tempting to start questioning…well, everything — but don’t do that! There are natural cycles of highs and lows that occur in any business. In business, just like in life, it takes a tremendous amount of consistent effort to see results. The experts agree that on average, it takes 2–3 years for a new business to begin to see a profitable return. So take a breath, be patient, and enjoy the process. Take ads like this with a grain of salt. Are you a little shy? Do you feel more comfortable “behind the scenes?” For years, I did too. However, a big way to engage your audience is through videos. Whether you start with a Facebook Live once a week or incorporate videos on your website, sales pages, thank you pages, etc. ; it can make a world of difference. As a consumer, when I am purchasing digital products and the owner has videos throughout the process, I feel like they are right there with me, like a personal guide. Start small. Do 30 takes if you have to! If you aren’t utilizing video, then it’s a great way to mix things up, boost your sales and your confidence. Whether you have a brick and mortar storefront, or everything you do is online, everyone can use a little tweak! If you have a shop, consider a fresh coat of paint, live plants, a new wall hanging, or even a complimentary coffee station to welcome your customers. It’s incredible how simple, inexpensive touches can impress your customers and turn them into fans. If you are solely a digital marketer, consider changing out a couple of images on your website, play around with a new background color, add a seasonal banner, or update your professional headshots. I bet you see your “bounce rate” drop and look completely on top of the trends. Remember to invite your audience to the party! If it’s a brick and mortar, have an open house to show off your new digs. If it’s online only, create a new lead magnet (freebie in exchange for their email) to entice them to the site. Everyone loves a deal! When things feel a little slower than you’d like, have a sale. Offers like BOGO (buy one, get one) pull in a lot of interest. Flash sales are super popular as well — where you offer a single item at a deep discount for 24 hours or even a limited time % off an hour consultation with you. Get creative — there are a ton of holidays where you can jump on the bandwagon and advertise like the rest of them. Although, I think to be original and zany stands out even more. Check out this site for wacky holidays. I am always amazed when my best friend reviews something that I’ve had in the works for ages and comes up with awesome insight in 2 seconds. When you are so invested in your work, it’s easy to lose track of things that appear obvious to others. It’s always a great idea to get a pair of “fresh eyes” to review your marketing materials, read a new post, check out a layout, or listen to a speech. We all have a different way of perceiving the same content. Reach out to a trusted friend or colleague. Establish a safe space for them to give you honest and direct feedback. Before you know it, you’ll see how you can improve your game, clarify your offer, and attract more interest. When things feel like they should be going a lot better than they are, it may be time to take a minute and get honest with yourself. Are you spending your time on business priorities and taking real action on a consistent basis? Or do you lose hours on social media clicking on interesting recipe videos or the latest fashion snippet? It’s easy to get lost. Let’s face it, we have a world of distractions at our fingertips…literally. When we feel like we are spinning our wheels (and it happens to the best of us! ), it may be a good time to question where and how we are spending our workday. If you manage a Facebook group, are you showing up daily and engaging warmly with your members? If you have a website, are you blogging on a weekly basis? If you have a boutique, are you present at local networking functions? These are important questions. Taking the time to chart how many hours spent on valuable, high-return tasks vs. low leverage ones can dramatically improve your business. What’s one of your favorite business strategies that you use to amp things up? Let me know in the comments.